This recipe makes a lot. 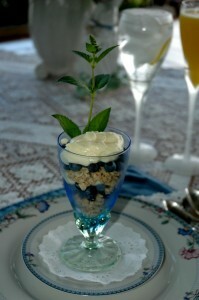 I layer in a parfait glass, the crème, fresh blueberries, and the granola two layers each, ending with a third dollop of crème on top. You would have enough crème to do possibly 16 of these. The crème will hold for several days in a tightly sealed container in the fridge. In a 3 to 4 quart pot mix together sugar, cornstarch and flour. Blend in water, orange juice, and lemon juice until smooth. Over medium heat, bring mixture to a gentle boil, stirring constantly with a wooden spoon. Simmer for 1-2 minutes. It will be thick. In a small bowl beat with an electric mixer the 4 egg yolks. Gradually beat in ½ C of the heated mixture into the egg yolks, and then dump the egg mixture into the pot on the stove. Cook over low heat to a second boil. Remove from heat and blend in butter and lemon zest. Transfer mixture to a bowl and cover with a buttered piece of wax paper. It can be put in the fridge overnight at this point. The next morning, whip the whip cream until firm and blend into cooled lemon mixture.